Baptismal service on the seashore of Ikuchijima Island (生口島) at Setoda (瀬戸田), Hiroshima Prefecture. The service was an activity of the Fukuin Maru (福音丸), the sailing ship used by the American Baptist Missionary Union to do missionary work in the Seto Inland Sea. 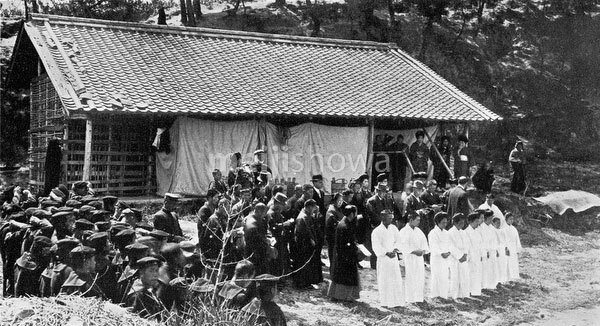 The mission was started in 1899 (Meiji 32). By 1916 (Taisho 5), the mission was active on 60 islands. Originally published in “Captain Bickel of the Inland See” in 1919 (Taisho 8). It is recommended to not print this image larger than than 15 cm for its largest side.